Let the computer check your math solution, step by step. We are excited to announce that we have added a CAS Calculator to 4f Checker. This means that you can now both check your solutions as before, but also calculate intermediate values, perform trigonometric and logarithmic operations and solve equations with the calculator. This feature will be automatically available for our existing 4f Checker users. Whether you are a middle school, high school or university level student, or an adult refreshing your memory, 4f Checker helps you to check if your derivation is mathematically correct. The checker formulates each step in the derivation as a mathematical theorem, and sends the theorem to an automatic theorem prover that runs in the cloud. The derivation is correct, if each step in the derivation is proved correct. In math, there are many ways to get to a solution. Math operations can be made in different order, calculations in several or few steps. We all think in different ways, and it may be difficult to see it the way your teacher does and teaches you. This doesn't mean that your way is wrong. 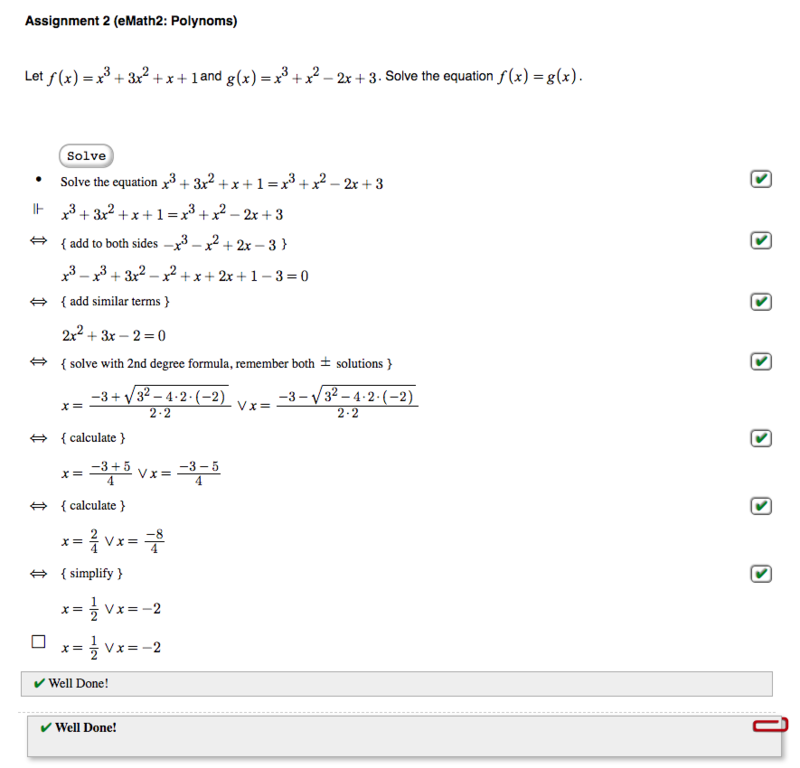 With the checker you can solve assignments your way, and check if it is mathematically correct. 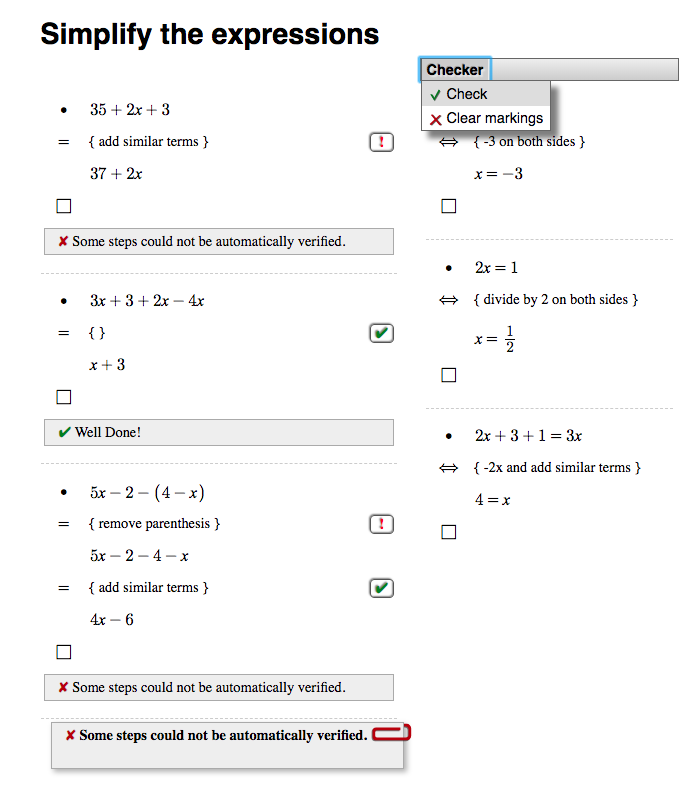 Students in your class can use 4f Checker to find errors in their own solution. It gives them immediate feedback while they are working on the problem. 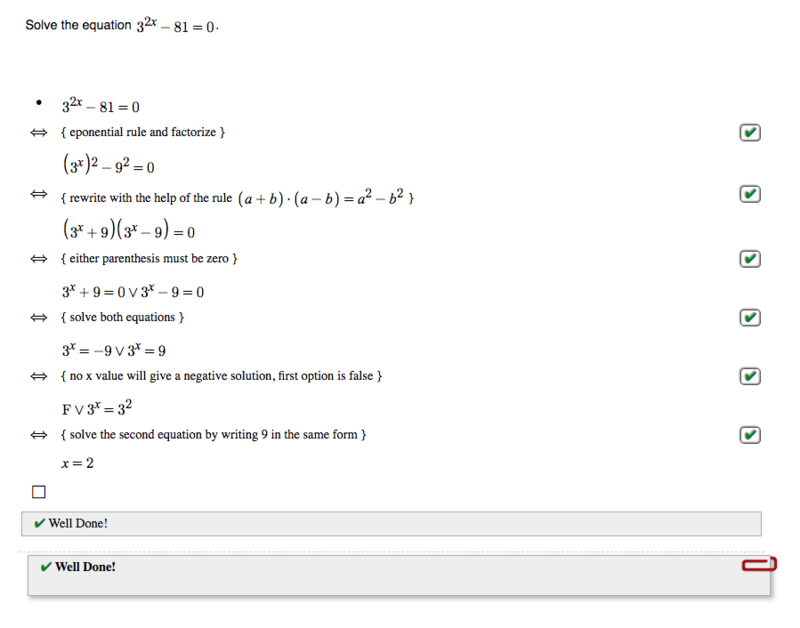 This can be minor calculation errors, formulas and theories used in the wrong way, or simply writing the wrong numbers. They get help with locating the problem, and will be able to correct some of the errors themselves, while everything is still fresh in their mind. They can send their solutions to you and you can then help them with the more substantial problems, the issues they have not understood. This will remove the obstacles to learning, and your students are ready to learn new things. You can also use 4f Checker to find errors in your students' solutions, or to check your own model solutions. Contact us to get a two month trial in your class. We provide support and examples when you need it! Thinking of hiring a tutor for your high school student? Success in High School opens many doors to future colleges and universities. It also affects your child's self esteem. We hear it a lot from adults, "I know I am not bad at math, but somehow I just missed a few things and never really got it..." In math, missing one point will make the rest very difficult to understand. Getting a little extra help exactly where it is needed will make all the difference for your child's future math studies. But tutors are expensive, so how about an e-tutor? The feedback loop in today’s math education is broken: students work on their math problems, but don’t get proper feedback on their own solutions. Rather, they are shown model solutions in class, and are supposed to spot the errors in their own solutions from these. Some can do this, but many will fail and keep repeating the same errors in subsequent homework, until they drop out because they just don’t get it. Teachers could help, but there is no time to give individual feedback and tutoring to all students in the class. My Math Checker is a monthly subscription that includes 200 checks per month. You can easily add subscription months or extra checks in the in-app shopping window. The subscription gives you access to the online application 4f Note and the automatic checker, 4f Checker. It is easy to write mathematical text on the note pages and add extra material such as graphs, images or videos. Use 4f Checker to see whether your derivation is correct ,after you finished or when in doubt when constructing the derivation. The checker goes through the solution step by step and points out the weak spots and potential problems in your mathematical arguments. You can share your solution with others by simply mailing the url of your page, to get help or to hand in your solution to your teacher. How does the checker work?